On huge reader's request, here SBN presents to you easy transformation style for men. Men's clothing code has gone quite versatile and relaxed over past few years and that helps in transforming the look from day to night quite easy. For the Formal Look, menswear demands quite relaxed and breathable silhouettes, which are the highlight of Myntra's New Collection. The collection is quite affordable and offers such a huge variety to spoil you males out there !! Men s fashion doesn't end at picking some basics for their wardrobe, however, it goes into selecting best of watches, perfumes and shoes. So, make sure you carry your head high on those confident shoulders. For the Casual look, just relax the shirt and trousers by folding the cuffs and pop open a button or two. 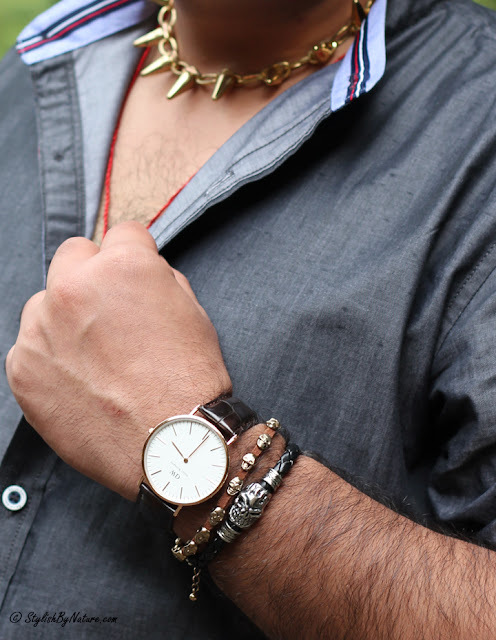 Add a dash of masculine accessories and consider changing into a funky belt. Fashion for men in casual avatar is more about attitude and charm, so make sure be on right spot. So in style! Thank You for sharing such a nice post! Very chic and trendy, handsome! Love this look, it's chis and casual the same...perfect!!! What a well-dressed gentleman! I really like the combination of chambray and khaki. Trendy and chic, like this combo! Absolutely love the look..except for that neck spikey chain thingy :(( But Rohit is rocking both the looks! !